The end grows ever closer: Bethesda has announced an official release date for the long-awaited post-nuclear role-playing game, Fallout 3. The game will hit North American shelves on October 28, and land in Europe three days later, on October 31. Bethesda Softworks is expecting big things from the game, according to company President Vlatko Andonov, who said, "To meet the huge demand for this title by our fans worldwide, we are planning one of the biggest launches of any game released this year." The latest entry in the Fallout franchise moves the action to the area surrounding Washington, D.C., where the player grows up as a member of Vault 101, 200 years after a nuclear holocaust has turned the world into an irradiated desert. Emerging from the Vault, gamers will face postwar organizations including the Brotherhood of Steel and the Enclave, as well as other assorted denizens of the wasteland. Technologically, the game has shifted from the isometric point of view of the first two titles to a selectable first-person or third-person perspective similar to that seen in the company's previous title, the Elder Scrolls RPG Oblivion. The turn-based combat of the original titles has also been changed to a real-time system incorporating the "Vault-tec Assisted Targeting System," which uses tactical pauses to simulate turns and allows for targeting of specific body parts. 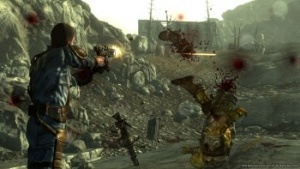 Fallout 3 is being released for the PC, Xbox 360 and PlayStation 3. For more information, check out Bethesda's official Fallout 3 website.